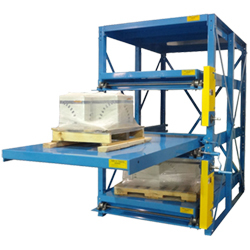 Easily load and unload heavy products that require a forklift or overhead hoist to be lifted, with the crank-out glide-out storage rack. Shelves glide out when the ergonomic cranking handle is turned on the side of the unit, allowing items to be easily accessed from an overhead crane or a forklift. 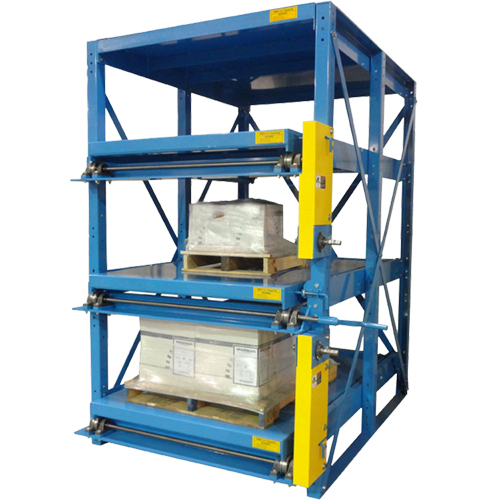 The cranking points for each shelf are placed at an ergonomic height, and when the shelf is fully extended to the maximum 75%, a locking pin slides into the shelf to make sure it is secure for the loading or unloading of products. Each shelf is constructed using an all-welded design, made from sturdy 10 gauge steel and have a capacity of 5,000 lbs. per level. Shelf Size (D x W): 48" x 48"
Capacity (per shelf): 5,000 lbs. Rolling Ladder w/ 13 Grated Tread 32"W Steps, 130" Platform Ht., 172" Overall Ht.